red berries round her milk-white neck, and a crazy stare. and round her wrists an amethyst as purple as her blood. led her to the harvest ball and pushed her to the men. stroked her brow and nipped her ear and squeezed her sapling wrist. undid ever knot and leaf, then threw her in the air. the opal beads shone ghostly blue, he fled the tears she shed. strung her up and made her swing then left her in retreat. and gave her diamonds faceted to blind men into shape. and no man dared approach her as she flashed her muted calls. bit her lip and swallowed hard and donned her kid-skin gloves. still she lines the ballroom walls, a blood-red stare, with grace. thorns facing outwards to keep the men in check. silver round her see-through skin and diamonds in her tongue. love a little, lick you clean, take away your glow. amber buttons ready to burst. like upright soldiers, drilled to give their best. challenges their strength and their will to serve. wave in the wind while they bide their time. 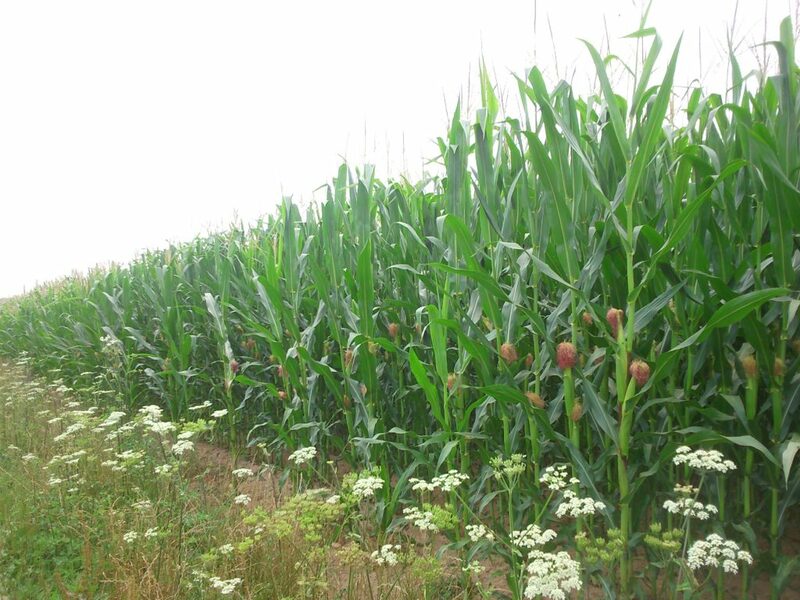 Lady’s Lace flower (also known as Queen Anne’s Lace; L. Ammi majus) growing next to Maize. 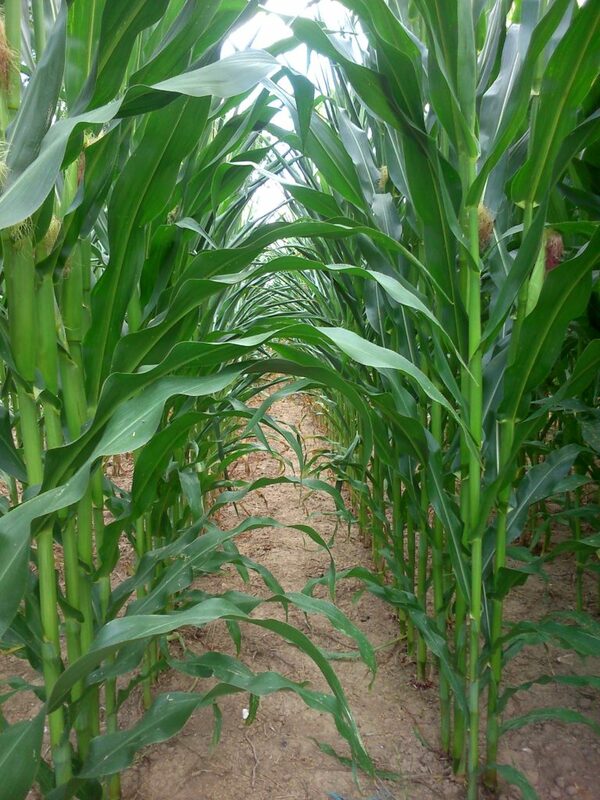 Maize, also known as corn, (L. Zea mays) was first domesticated in Southern Mexico 4,000 years ago. Research has shown it is highly adaptable, and thus capable of dealing with climate change. It was brought over to Europe between 1750-1850 and became the staple diet of peasants in Mediterranean countries. 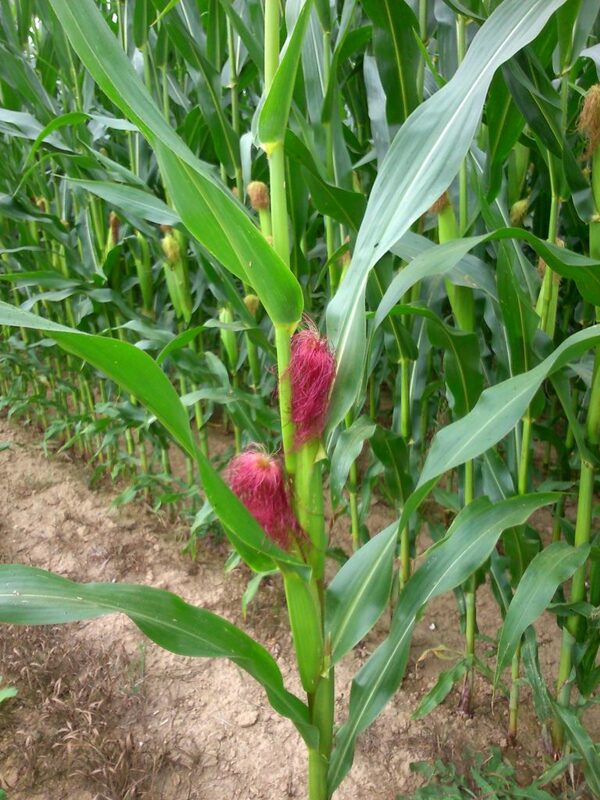 However, maize lacks lysine and tryptophan – amino acids – needed to produce proteins, and its niacin (vitamin B3) is coated in an indigestible complex. To break down this complex, the Mayans and Aztecs boiled maize in alkaline limewater to release the niacin, but this practice wasn’t continued by the settlers in the New World, nor by those in Europe (the ‘Old World’), resulting in epidemics of Pellagra as of the 16th century onwards. Life threatening diseases such as Kwashiorkor (signs:rotting – and loss of – teeth, dermatitis, depigmentation, thinning hair, swollen abdomen, enlarged liver), are unfortunately still present in poorer, under-developed countries. 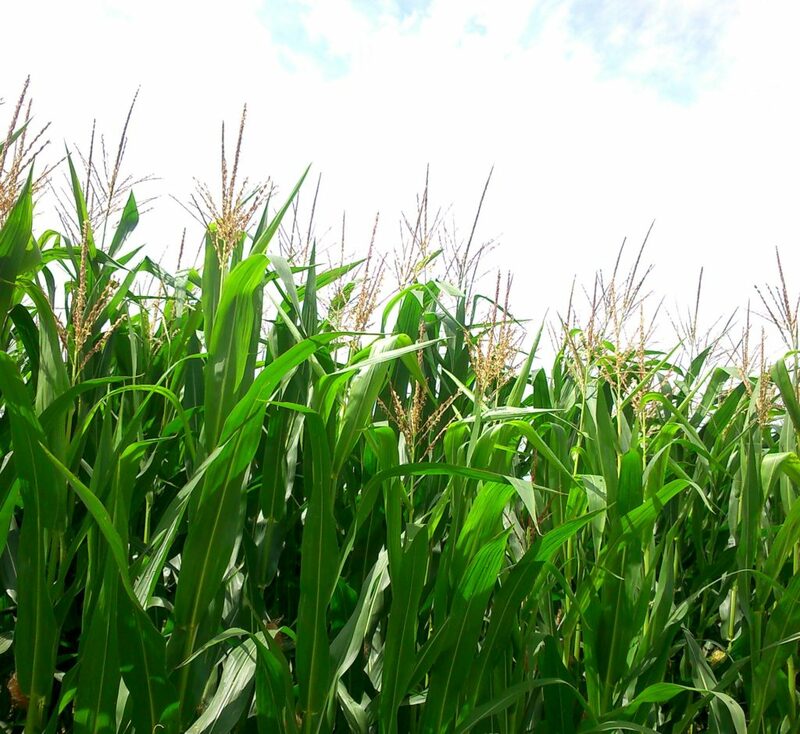 The Cherokee and Mohegan tribes in North America used corn as a salve for skin problems. The Navajos used it as a treatment for sore throats, and the leaves were used in a mixture for the Night Chant medicine. The Tewa also used it to treat glandular swelling in the neck, and mixed blue cornmeal and water for palpitations and chest pains; black corn with red streaks served as gynaecological aids. as you carve your kingly way to topmost things. clear the clouds to welcome in the blue. The Song Thrush (Turdus philomelos, La Grive musicienne) has long wings enabling it to migrate over very long distances. Their strong, rapid wing beats allow them to soar high and maintain an easy cruising speed. During migration they fly mostly at night. In the morning, those that come to land catapult in at high speed to woody areas to ensure their safety. However, many Song thrushes in Britain and France are ‘sedentary’, i.e. are resident year round and do not migrate. Check out his song here. Photograph: Song Thrush (Turdus Philomelos), Taco Meeuwsen, Hellevoetsluis, The Netherlands. and won’t give up, while those around her fall. like her, with full determined grace. 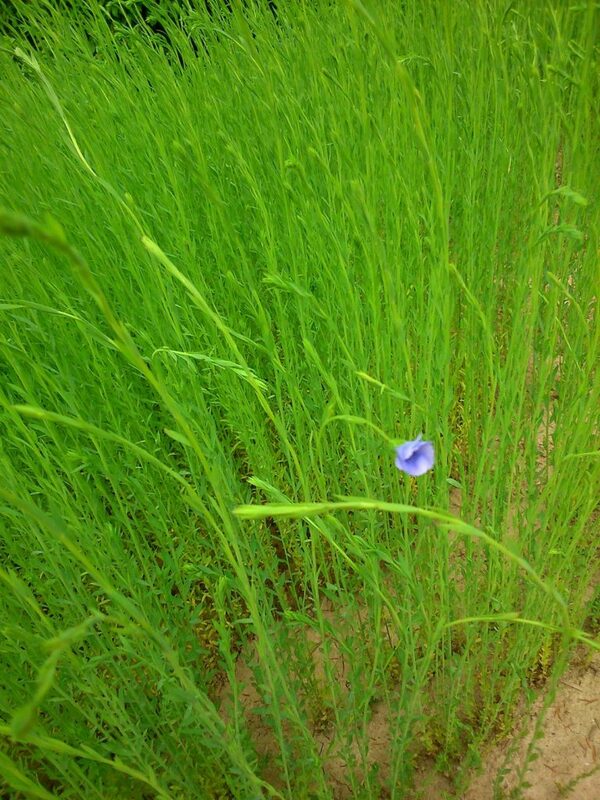 This poem was written following the knife attacks in Paris and London and a terrific wind storm in Normandy, after which I found a lone flax flower still standing in a partially devastated field. 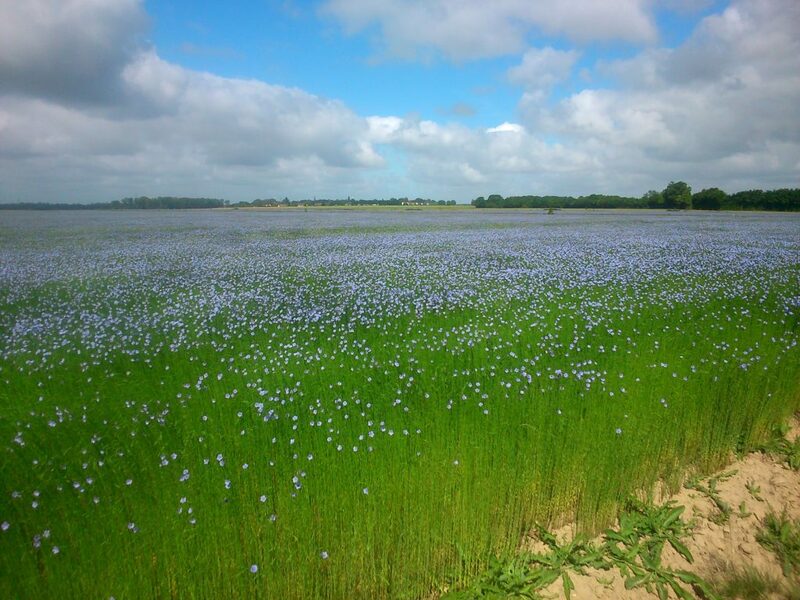 The north part of Normandy, thanks to the humid climate and silt in the soil which retains the humidity, is one of the regions of France best suited for flax growing. Half of European linen grows in Normandy; France cultivates 76% of European linen. France is the first producer of linen in the world, ahead of China and Russia. China produces linen of lower quality; it buys scutched linen from France which is then spun and woven in China.